Is your marriage getting bitter instead of better? Every married couple needs to read and apply the information in this important article. Several years ago, I sat looking into the eyes of a harried husband and wife. I was desperately trying to show them how to save their marriage. They listened as I instructed them on how to love one another. Yes, they listened — week after week, month after month, sermon after sermon — but they did not do! Their marriage did not get any better, just bitter. This marriage failed, ending in the pain and sorrow of divorce. But why did it fail? And why isn't your marriage, perhaps, as happy as it ought to be? There is a missing dimension to marital happiness — a dimension millions have overlooked. Without this vital key, everything you try to improve your marriage will be futile. Without this ingredient, marriages simply never reach the level of pure joy that they could and should reach or, more and more today, marriages decay and grow cold, often ending in divorce and family breakups. What is this ingredient? The missing dimension in marital happiness is the Holy Spirit! Surprised? Marriage partners need to use the Holy Spirit, not just have it. There is a big difference between the two. We may think about using the power of God's Holy Spirit to overcome personal sins and yet neglect using it to overcome one of the biggest and most personal sins of all — an unhappy marriage. Almighty God created the divine institution of marriage and gave access to this vital key to marital happiness. Let's go back to the first marriage and see what we can learn. God said in Genesis 2:18, "It is not good that man should be alone; I will make him a helper comparable to him." Adam was very lonely. He even looked among the animals for a mate, but found none (verse 20). Then God put Adam to sleep, took one of his ribs and fashioned a woman, Eve (verses 21-22). When Adam woke up, God presented Eve to him. And what was Adam's response? Was it the calm, cool, collected "Now this is bone of my bones" that most Bible translations give (verse 23)? No! The original Hebrew word for "now" is pa 'am. Its meaning is far more intense than a casual "now." Pa'am means to "impel" or "move." And Adam was moved, all right, at the sight of Eve. He was a skyrocket in flight — "now" might be better rendered "wow"! Adam was exuberant. He thought Eve was all he needed to be happy, that she was the answer to all of his problems. But God knew better. You see, man cannot live by mate alone, but by the very Spirit of God. So God entered their lives and performed the first wedding ceremony. This was not just for honor's sake, but was an example for all future married couples. God married them, for it was only by God living in each of them (through the Holy Spirit) that true marital happiness could have been produced. It is God in the midst of a marriage, dwelling in the lives of husband and wife, that joins them together in unending marital bliss (Matthew 19:6). Unfortunately, Adam and Eve rejected God in their marriage. How, you ask? By rejecting the tree of life, which represented God's way of give, which can only abide in us through the Holy Spirit. Had Adam and Eve chosen the tree of life, their marriage would have been blessed with all of the sweet, love-giving, beautiful fruits of the Spirit. But they chose the tree of the knowledge of good and evil, which represented the way of get, the way that leads to unhappiness. This tree filled their marriage with the bitter, caustic, withered works of the flesh (Galatians 5:19-21). With God out of their lives, the marriage of Adam and Eve became a free-for-all of getting and taking from one another. Through following the way of get, they lost their beautiful home in Eden (Genesis 3). What about your marriage? Which tree thrives in your married life? The answer lies in its taste — sweet or bitter. You be the judge. Surely, all of us want our marriages to be sweeter, but how do we promote the fruits of the Spirit in our marriages? Why did Adam and Eve reject the tree of life? Why do people reject it today? Because of their unrepentant, unyielding attitudes toward their Creator God. Repentance is the key that unlocks the tree of life and all of its wonderful fruits. Repentance means change. It means to turn around and go the other way. But to change, you must have a totally conquered and yielded mind. Self and selfish desires must be completely removed, for selfishness is the No. 1 destroyer of marital happiness. The apostle Paul repented and totally yielded his life to God. He put to death his carnal mind with all of its ego and selfish ways. Of his life he writes, "I have been crucified with Christ; it is no longer I who live, but Christ lives in me" (Galatians 2:20). Repentance — death of one's selfish way and total yieldedness to God — is the only way to the tree of life. You must totally remove the self for God to dwell in you through the Holy Spirit. There is not enough room for both you and God in you. Somebody's got to go — let it be the carnal you. Do as the apostle Peter commanded: "Repent, and let every one of you be baptized in the name of Jesus Christ for the remission of sins; and you shall receive the gift of the Holy Spirit" (Acts 2:38). Your repentance of self and selfish desires must be a continual process. Sometimes we look at repentance as a state rather than a process. Repentance of self requires a second-by-second, thought- by-thought vigilance. You must bring every thought under scrutiny, and if it's selfish it must be destroyed (II Corinthians 10:5). How, you ask? By bringing a corresponding unselfish thought into your mind. You need to repent — yield to God and get yourself out of the way — and the tree of life will flourish in you through the power of God's Spirit. Then and only then will you be able to give happiness to your mate. 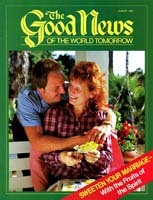 Now let's look at the fruits of the Spirit that will sweeten your marriage. They are listed for us in Galatians 5:22-23. The first fruit of the Spirit mentioned in Galatians 5:22-23 is love. Love could be considered more of a vine than a fruit — it is the channel through which all of the fruits are given. And what is love? Love is not a feeling or emotion. It is not the way your mate makes you feel, either. Love is giving. Love is a conscious, willful commitment to give to your mate, even though you may think he or she is undeserving, without expecting anything in return. This kind of love is supernatural. It inspires a truly repentant, Spirit-filled person to give unconditionally. This kind of love comes only from God, and He gives it to us to give to our mates through the power of His Spirit (Romans 5:5). Jesus told the selfish Pharisees to "love your neighbor as yourself" (Matthew 19:19). Jesus knew the only way they could understand love was if He made reference to the self. Carnally, you will love only yourself — you won't love your mate, except in a human, selfish, perhaps only sentimental way. So who will love your mate — who will give your wife or husband the luscious fruits of the Spirit? God in you! Only God in you can give true love to your mate. Notice that you give the fruits of the Spirit to your mate. You are to be a kind of tree of life in your marriage. Now think: Have you ever seen a tree eating its own fruit? Of course not. A tree gives its fruit for others to eat and enjoy. The fruits of the Spirit, flowing from you through the power of the Holy Spirit, are for your mate to enjoy. As wise King Solomon said, "The fruit of the righteous is a tree of life" (Proverbs 11:30). Joy is the happy fruit. This fruit sweetens the entire flavor of your marriage. Joy is a positive, exhilarating attitude of happiness despite circumstances — yes, joy is present even in the face of problems. This takes the consistent power of the Holy Spirit, not fickle emotion. Our carnal, selfish minds automatically become irritable and negative when things do not go our way. Our mates receive the bitter fruit of sadness instead of the sweet fruit of joy, and our whole marriage turns sour. You should repent the moment you sense your mind turning negative, by casting the thoughts out of your mind. Then ask God to inspire you with a positive attitude in the face of the problem. Joy is highly contagious. Let your outgoing joy radiate and fill your marriage and family. Peace is the miracle fruit that produces harmony. When you give your mate the fruit of peace, your relationship becomes calm and cooperative. Peace is not necessarily the absence of problems. It is the ability to solve those problems. We are not peaceful naturally. Paul said we do not even know the way to peace on our own (Romans 3:17). Ask God to show you how unpeaceful you really are, and He will show you how striving to "have it your way" encourages conflict. You will see how you have upset the peace so many times by wanting to get rather than give. Once God has shown you how contentious you have been, you must repent. Push out those raging desires to "win" that argument or disagreement. You may win the argument but lose your marriage in the process. Yield to God's peaceful Spirit by turning God's inspired thoughts of peace into action. Give your mate that "soft answer" that "turns away wrath" (Proverbs 15:1). "Overcome evil with good" (Romans 12:21). It takes two to fight, but it takes only one to give. Give your mate peace and let that peace that "surpasses all [human] understanding" (Philippians 4:7) fill your marriage. Longsuffering is the fruit that never spoils. Here is one fruit you can never give enough of, and it lasts a long, long time. This fruit is also called patience. Your mate could always use some patience from you, and vice versa. But longsuffering and patience seem to be in short supply in many marriages. Husbands and wives can easily get short-tempered with one another, especially when our mate fails to satisfy us when and how we want him or her to. Suddenly, our fuse sizzles and we explode, or we are disgruntled and dissatisfied because our mate is not changing fast enough — not growing fast enough in the way we want. Repent of your short-fused, self-satisfying attitude, and guard your mind in the future. When you feel your fuse begin to burn at the imperfections and mistakes of your mate, stamp it out before you explode. You have a few imperfections of your own. Yield to God's Spirit of longsuffering and patience. The apostle Paul preached that true love "endures all things" (I Corinthians 13:7). Gentleness or kindness, describes the delicate nature of our next fruit. Its meat is so soft and tender. What is gentleness? Gentleness is a delicate sensitivity to the needs of your mate. After sensing the need, gentleness fulfills the need with loving care. Oh, how your mate needs God's gentleness from you. Do not let its delicate characteristics fool you, either. It will make your mate feel secure and strong in your love. This satanic, sadistic society has stripped many husbands and wives of "natural affection" (II Timothy 3:3, Authorized Version). Today, gentleness is equated with weakness, but the truth is that your marriage may be weakened by a lack of gentleness. Examine your own nature. Are you gentle or harsh with your mate? Better yet (if you really want to know), ask your mate. It's time for you to change — to repent and bury the old, cold you. Promote the new, caring, gentle child of God in you (Romans 6:4-5). Goodness is the biggest fruit of all. Goodness will fill and satisfy your mate's hunger for love like nothing else. Goodness is being bighearted. It is giving and doing for your mate without restraint. What have you done for your mate lately? Not as much as you could have, right? Come on, now, be honest. Honey?" Then repent of your self-serving attitude. Get up and do it yourself, and while you're at it, do something for your Honey, too. Love is what you do, not just something you say or "feel inside." If you yield your will, God will inspire acts of goodness toward your mate. Faithfulness — now here is a fruit that will stick to your mate's ribs. This fruit will give confidence and inspiration to your mate. Faithfulness is dedication and loyalty, but more than that, faithfulness is giving reassurance and encouragement. How much of the fruit of faithfulness have you been giving? Are you faithful to your one and only mate? "Of course," you say. But what about your mind? Do your thoughts stray to others? Almighty God says that even an unfaithful thought is adultery (Matthew 5:28). When those lustful thoughts come into your mind, repent by putting them out and replacing them with pleasant thoughts about your own mate. What about encouragement? Do you inspire confidence and courage in your mate? Do you build up or tear down? It's so easy to criticize and find fault. Let the fruit of your tongue be encouragement and praise. Look for the good and positive in your mate and concentrate on that. When your mate is down, give the encouraging fruit of faithfulness to build up. When he or she feels like giving up, give the confident fruit of faithfulness to help your mate carryon. Meekness is a great fruit in a small package. Meekness is the smallest yet most potent fruit of them all. Meekness is the spirit of humility. A truly meek mate realizes his or her smallness before Almighty God. A meek mate will "esteem others better than himself' (Philippians 2:3). What is your attitude? Do you feel that you are better than your mate? What do your actions show? If your attitude has been one of pride and superiority, now is the time to change. Now is the time to humble yourself before God and your mate. Don't let your stubborn pride stand in the way of a happy marriage. Husbands, give in to God's Spirit as it leads you to place your wife above yourself. That's right, she is not inferior to you. God created both man and woman in His image (Genesis 1:27). But, you may be thinking, didn't Peter call wives "weaker vessels"? Yes, he did, but not in the way you may be thinking. In I Peter 3:7, Peter wrote that husbands should give "honor to the wife, as to the weaker vessel." Notice Peter used the word honor. This word gives positive direction to the whole verse. Peter speaks of a structurally weaker vessel that has esteem and value. The wife could be compared to a delicate yet beautiful piece of Steuben crystal. You put fine crystal in a showcase. You give it honor. Structurally, a husband could be compared to a "stronger vessel." Perhaps you have a crusted old cast-iron skillet. That skillet may be the workhorse of your kitchen — perhaps you've been using it for years. Nothing can hurt it — it's indestructible. Now, which vessel is more valuable? Neither! They mutually excel one another according to their ordained purpose. If husbands and wives esteemed each other better than themselves, they would automatically treat each other with more respect. Feelings and actions of inferiority and superiority would not exist. So why not grow the fruit of meekness on your vine? Allow your mate to rise in your eyes. Let this tiny but potent fruit lift your marriage to new heights of ecstasy. Self-control is the last fruit at the end of the vine. It regulates the taste, growth and giving of all the other fruits . This fruit also subjugates and destroys all carnal, selfish tendencies. These fruits of the Spirit will not automatically grow or be given to your mate. Your marriage will not automatically become better instead of bitter, either — it takes effort. You must actively and consciously control your carnal mind every moment of your life. Then you must use God's Spirit by yielding to God's inspiration to produce all of the fruits of the Spirit for your mate. You can increase the happiness of your marriage by using God's Holy Spirit. We have talked enough — now is the time for action. Now is the time for you to turn your marriage around and make it sweet instead of bitter. "I say then: Walk in the Spirit, and you shall not fulfill the lust of the flesh" (Galatians 5:16) . Satisfy your mate with good fruit — give, give, give. Sweeten your marriage with the fruits of God's Holy Spirit!